Bhalobashi Song Lyrics From Teenkahon Bengali Movie. This Song Is Sung By And Music Composed by Arnab Chakraborty. 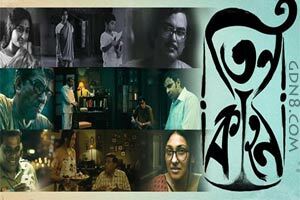 Starring: Suman Mukhopadhyay, Rituparna Sengupta, Ashish Vidyarthi, Sabyasachi Chakraborty, Dhritiman Chatterjee, Kharaj Mukherjee, Manasi Sinha, Biswanath Basu And Others.